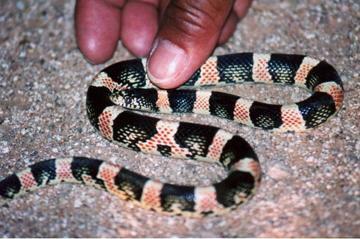 If you are a veteran visitor to these pages you are already familiar with the work of Arizona naturalists Ralph and Boonmee Rose. They're back, with a new twist. They've been going to the desert in the evening to photograph--up close and personal--the critters that come out at night. See more of their photos and learn about their techniques in the January issue of the online magazine DesertUSA. Is this close enough for you? Boonmee is petting a Long-nosed Snake (Rhinocheilus lecontei). 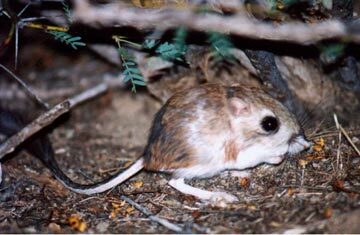 Boonmee's Photograph of Merriam's Kangaroo Rat (Dipodochys merriami), a very cute animal about 10 inches long (six inches of that length being his tail). 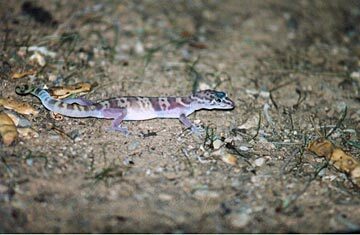 This is a Western Banded Gecko (Coleonyx variegatus), a very brightly colored nocturnal lizard, related to, and about the same size as, the "chinchuck" of Southeast Asia.